two on, Yankees batter Lyle Overbay attempted to check his swing on a 0-2 curveball from Dodgers pitcher Paco Rodriguez, ruled a ball by HP Umpire CB Bucknor and affirmed as no swing by U3 Miller. During a subsequent pitching change following Overbay and Jayson Nix's at-bats, Mattingly was ejected, the call was irrecusable. At the time of the ejection, the Yankees were leading, 3-0. The Yankees ultimately won the contest, 3-0. This is Bill Miller (26)'s 2nd ejection of 2013. Bill Miller now has 0 points in the UEFL (-2 Previous + 2 MLB + 0 Irrecusable Call = 0). Crew Chief Dale Scott now has 4 points in the UEFL's Crew Division (3 Previous + 1 Irrecusable Call = 4). This is the 111th ejection of the 2013 MLB season. This is the 54th Manager ejection of 2013. 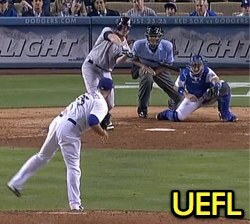 This is the Dodgers' 9th ejection of 2013, 1st in the NL West (LAD 9; ARI 7; SF 4; SD 3; COL 2). This is Don Mattingly's 2nd ejection of 2013 and first since June 1, 2013 (Brian Knight; QOC = Correct). This is Bill Miller's first ejection since April 30, 2013 (Bruce Bochy; QOC = Incorrect). Too bad. Bucknor was calling a great balls/strikes game behind the plate until Miller's foul up. Not that this game wasn't lost when Mattingly stupidly decided to take out Kershaw with under 100 pitches. Oh well, yet another Kershaw masterpiece with zero runs allowed that Mattingly found a way to turn into a loss. Stupid ejection. Thanks Janet.....check swing....he didn't go. If you watch the video...CB didn't think he went either......twice! What was Mattingly looking for? He got the answer in black and white! Although it is irrecusable, the call was incorrect. The Dodgers broadcast didn't replay either of the check swing calls, but the Yankees broadcast did. The first one (for strike two) was correctly ruled a swing (by Miller on appeal from Bucknor), but the second one was incorrectly ruled "no swing" by Miller on the appeal. The replay showed Overbay went further on that swing than he did on the previous one. Dang, I had just went to bed in B8 of this one. But in the end, even the homer in me has to admit that check swings are among the hardest calls to make and even harder to actually explain. So, I don't question any checked swing calls and I will always assume the call is correct. I mean, think about it...for an appeal on a check swing to happen you already have one umpire saying the swing was checked. Since there is no rule defining a swing an umpire cannot be right or wrong it's a case of agree or disagree. Marvin Hudson just tossed Tulowitzki from the Braves/Rockies game. Borderline pitch called strike 3 and 'Witzki wouldn't leave. Are those the precise PitchFX numbers, or...? Did you measure it with your ruler? I think what is annoying about this comment is that umpires KNOW the importance of angles, perception and distance. The cameras in center field are great for TV but lousy for having any perception of the 3-dimensional box known as a strike zone. To present someone as blowing calls based on those poor vantage points and to present it as being accurate within at least 4" is insulting. Nice spelling and punctuation. Also, the in game pitch track systems have been proven to be a little bit off. I am not even saying that Hudson didn't miss those pitches but to say he missed it by 3 and 7 inches are just wild guesses that have no basis of factual information in them. Hudson may have missed the pitches, but get mad at Tulo. Hudson gave him plenty of time to leave and he did not. With Cargo and Cuddyer already out he put his team in a bad situation.